Think back on the last two weeks of your life. Have you felt like part of your soul was missing? Have you noticed an eerie silence ringing in your ears? Did you wake up in a cold sweat at 3:28 am last night and scream, "GODDAMMIT EDWARD, YOU GAVE US A SINGLE, BUT WHERE IS THE MUSIC VIDEO?" Your nightmare is over, because Edward Snowden has finally gifted the world with a music video for his single, "Exit". The Verge premiered the clip, and described it as "definitely strange". That's one way to put it. Another would be to call this music video a fitting visual representation for a truly, truly bad song. It appears as though the video's creators simply decided to crib together clips of news broadcasts, The Matrix, random hackers and shots of Jean Michel Jarre, Edward Snowden's music-making partner, wearing sunglasses while riding public transportation. 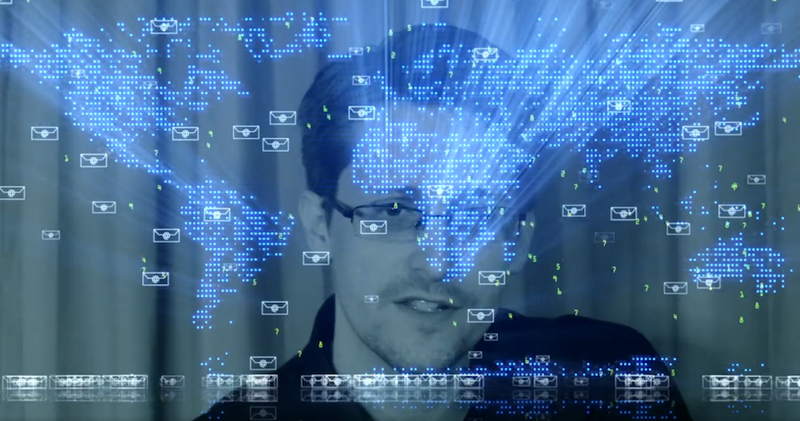 There's also a lengthy clip in the middle of an old Snowden interview, which ends with nine Snowdens on the screen. Of course, the message — not to mention Snowden's contributions to raising the world's collective awareness about privacy — is no laughing matter. The NSA remains a terrifying, monstrous entity, and Snowden's role in revealing the debacle of global surveillance operations and government spying has been nothing short of transformative. But this music video is bloody hilarious. And somewhere in cold, snowy Russia, Edward is masturbating furiously while watching it on a combined loop with the trailer for the new Snowden movie.